We are back with another issue of ‘Best of Beacons this Week’. This week we’ve got a great lineup of beacon articles in store, including how Pizza Hut installed beacons across 1471 locations, to why Wi-Fi and beacons can work together to deliver great experiences, and more. So sit back, sip a cup of coffee and check out the stories we have lined up for you. 1,471 Pizza Hut restaurants in mainland China have installed Bluetooth Low Energy (BLE) beacons to send out coupons, WeChat movie ticket prizes, special offers and discounts directly to customers’ smartphones. As food and beverage marketers compete for the largest share of consumers’ wallets in an increasingly tight sector, beacons could be the solution to offer a brand a leg up by distributing engaging content and coupons to frequent visitors. Customers in Pizza Hut restaurants just need to turn on Bluetooth on their mobile devices and open up the ‘Shake’ feature on WeChat to get a chance to receive discounts or gifts such as free movie tickets or prizes. Check out this article to learn how Pizza Hut is leveraging beacons to augment in-store dining with the help of beacons. According to a recent research from Zebra Technologies, around 51% of shoppers are interested in using location-based coupons in stores, nearly half (45%) would use location-based shopping maps in the store, and 41% would use location-based associate assistance. It is thus evident that, as consumers become more digitally connected and savvy, they expect their favorite retailers to provide highly relevant and personalized experiences — especially while they’re shopping in stores. Another interesting finding is – a whopping 64% of consumers want retailers to give them more flexibility to control how their personal information is used to tailor their experiences. These results are from the survey of approximately 2,000 shoppers in the U.S., Canada, Singapore, Australia, England, Italy, Spain, France, Germany, China, Japan and Thailand. Read on to learn some very interesting stats on consumer attitudes towards location-based services. “Combining WiFi and iBeacons in the future can provide for a better experience for visitors” says Jon Little, Product Manager of Royal Botanic Gardens at Kew in his post on Linkedin. In this post he talks about how Wi-Fi and iBeacon can work together rather than against each other to deliver seamless visitor experiences. There are issues that a combination of these two technologies can together solve – for example, better internet connection as visitors can connect to Wi-Fi rather than mobile data to receive messages etc. He also mentions that in the future their app could do things like – knowing a visitor is in a WiFi zone, ask him/her to connect to it and then provide the means through which the visitor can be provided with a relevant, timely and high quality piece of information. Read this post to gain more insights on his learnings from the beacon pilot at Kew Gardens. Enterprises with multiple locations should focus not on beacons but on how beacons can strengthen their mobile wallet offers. Coupling proximity-based technologies such as beacons or GPS notifications with a strong mobile wallet offer will deliver customers to your register, not just to your storefront. The post points out the fact that, though being present for mobile searches is an important element of local search, enterprises need to go beyond “being present” at a time when consumers are collapsing the sales journey with mobile. Enterprises need to own the “next moment,” or the action that occurs when someone finds your brand on search. Read this post to know how mobile wallets relate to beacons and how and why you should use be using location-based technologies such as GPS and beacons. 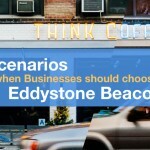 We recently announced that our beacons are now Eddystone compliant. Starting this week, we are shipping Eddystone compliant beacons to anyone who places an order for a Beaconstac kit. And as part of our move towards dual support for iBeacon and Eddystone beacons, we have made available the ‘BeaconStone’ Android app – a useful scanner app that can detect both iBeacon and Eddystone-compliant beacons, from any manufacturer. Using the app, you can filter beacons based on whether they’re broadcasting Eddystone or iBeacon packets, sort beacons by signal strength, major and minor numbers and also view telemetry information, temperature, and URL for Eddystone beacons. Read this post to know more about it.